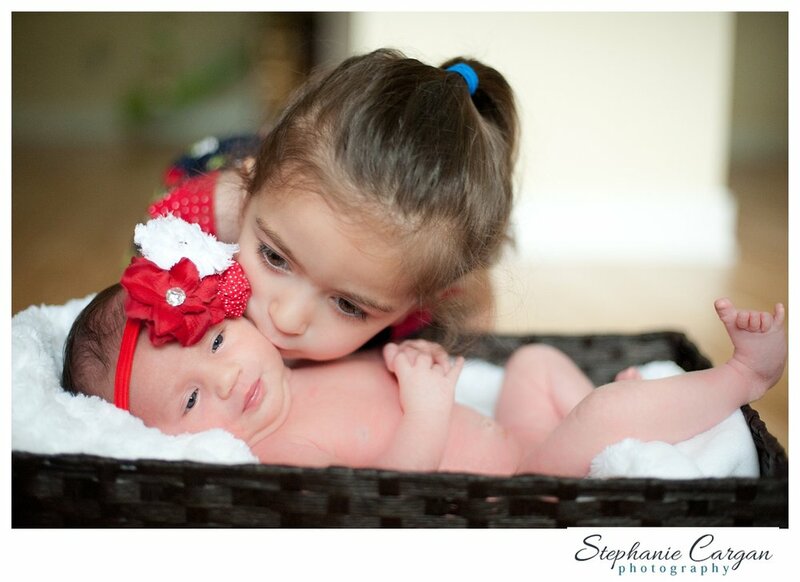 Juliette and her new baby sister, Caroline! I have know Caroline and Juliette's mom, Lisa for as long as I can remember. And I love that, MANY years later we were able to reconnect through our own little business endeavors. Lisa is so creative and is owner of Little Ette Designs. All of the adorable headbands and props here are Lisa's creations! How lucky are Juliette and Caroline? They will always be dressed to the nines and have girly tu-tu's at their fingertips! I have been lucky enough to photograph some of Lisa's work before, so when she contacted me to do a newborn shoot when her little one arrives I was so excited! I could only imagine how cute her own little nugget would look in her designs. And was I right! What until you see Caroline rockin' these headbands. So adorable! And Caroline's big sister Juliette is just such a ham. She might have made 3 or 4 wardrobe changes while Caroline spent some time in front of my camera. But it all came down to her all time favorite - her pink tutu and pretty frilly shoes! Too cute. Lisa - it was so good to see you again! Your girls are absolutely gorgeous! I hope you love these! And her big sister, Juliette! I kinda want a cacoon like this for myself. is that weird? I love Juliette peaking in the background! Gotta keep an eye on her little sister!